Shop A Baby, online at aBaby.com for high quality baby furniture at excellent prices. A Baby is rated #1 among online furniture stores for the most exclusively designed baby furniture and baby bedding. At A Baby choose from an extraordinary selection of Baby Cribs, Round Cribs, Toddler beds, bedding, Bunk Beds, Glider Rockers, Highchairs and Specialty Toys like rocking horses and doll carriages. Save on your next purchase from aBaby.com with aBaby discounts, aBaby coupons, aBaby promotions and aBaby savings found here on 58Coupons.com. 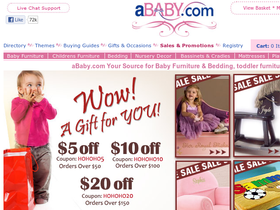 Shop aBaby.com and get 25% off your crib purchase of $1000 or more with this coupon code. Click link. Get your gear from aBaby.com and you can save 10% off your purchase with this coupon code. Check out aBaby.com and you can get free shipping on select items. Click link to shop. Use this coupon code on aBaby.com and you can save $10 off with your purchase of $100. Click link. Get $25 off your order of $250 or more at aBaby.com with this coupon code. Don't miss out on the clearance section on aBaby.com where you'll find savings up to 70%. Check out the Deal of the Day section every day to save up to 50% from A Baby.